MV Loch Dunvegan, the regular vessel on CalMac's Rhubodach-Colintraive crossing. As the effects of the ‘weatherbomb’ which struck much of north-western Britain this week begin to recede, it appears that Bute escaped largely unscathed - apart from those hoping to use the island’s principal ferry link with the mainland. There were no ferry sailings between Rothesay and Wemyss Bay all day on Wednesday, with reviews of the weather at 8.15am, 10.30am, 12.30pm, 2.30pm and finally 4.30pm all resulting in the decision that it was not safe to sail. The Rhubodach-Colintraive ferry, however, kept ploughing on, fulfilling all timetabled crossings until the early evening, when deteriorating conditions led to all further sailings being cancelled after the 5.10pm from Colintraive and the 5.20pm from Rhubodach. Across the CalMac network, only one other sailing operated all day apart from those made by MV Loch Dunvegan on the Rhubodach route - a single return crossing by MV Hallaig between Sconser, on Skye, and the island of Raasay. 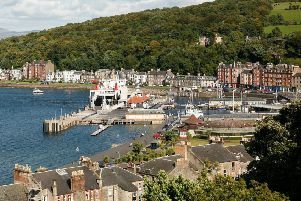 Argyll Ferries’ passenger-only Gourock-Dunoon service was also hit, as was Western Ferries’ route between Hunter’s Quay and McInroy’s Point, which was suspended for a spell during the afternoon. Though Rothesay’s ferry service resumed first thing on Thursday morning - albeit still on ‘amber alert’ - there was disruption between Rhubodach and Colintraive after a power cut turned off the lights at both slipways, leaving the ferry unable to sail safely until daylight dawned. That power cut also affected most, if not all, of Bute, though supplies were quickly restored. The interrupted power supply apart, there were almost no weather-reported incidents on the island reported to police in Rothesay during the worst of the high winds: a fallen tree partly blocked the A844 near Ballianlay on the island’s west coast, but the obstruction was quickly removed by Argyll and Bute Council’s roads department. There was also a report of falling masonry on a tenement block in Rothesay’s West Princes Street at lunchtime on Tuesday, as the winds were beginning to grow in strength, though no-one was injured. At the time this article is published, although the Met Office’s high winds warning is no longer in force in Argyll and Bute, a fresh ‘be aware’ warning has been issued for snow and ice across much of the west of Scotland, lasting until 11am on Friday, December 12. The forecast for Rothesay is currently predicting some light snow showers in the early hours of Friday morning, with a minimum overnight temperature of 2 degrees Centigrade - though the wind chill factor will make it feel some five degrees colder throughout the night than it actually is.